How do I make this work with finsternis' models for wotlk? One way: Install both of our mods then create your own mod which just contains a merge of our CreatureDisplayInfo.dbc files and install that on top of everything. The info.txt file included with my mod has a list of all the DBC edits I've made (it's not very many) to make that easier. This model is usualy picked by hunters, so you can see it quite often. By the way those can be found in Blades edge mountains around sylvanar and in netherstorm inside first eco dome. This is just mumbo-jumbo for about 99% of the users on this Forum. Finsternis' won't make an optional Tree of Life form download because he "doesn't like it" so we're kinda screwed there. These are fantastic! Thank you so much for converting them over to TBC. Any chance you could provide an option to allow travel form to be Cheetah form? I fixed this a while ago but i think I never uploaded it, woops! I'll upload the update soon, but I'm going to wait until I update the bear form with the new BFA bear animations. do you think you could make a separate version of the new bear form for the MoP? Does 6 months count as "soon"? 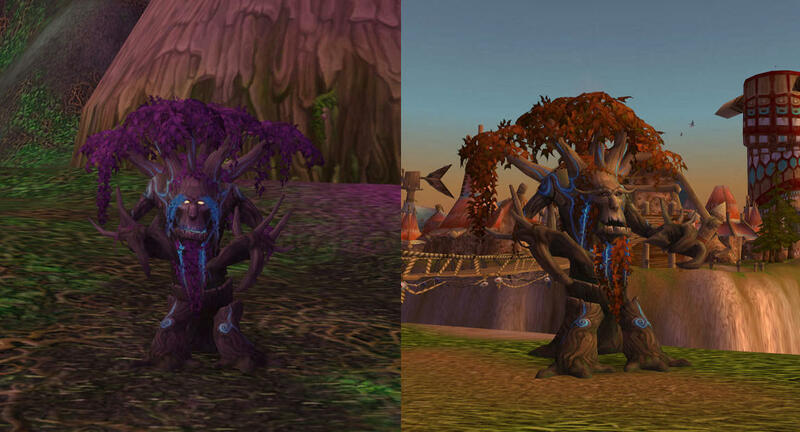 Updated to fix the lynx models + added the new BfA Druid Bear model. The new BfA bear model has the new more upright animations but also came with numerous bizarre problems and oversights that I fixed; like a cleft palette and incorrect render-flags on the NE version's eyes. Hi, how can I use this mod with the one from Finsternis? I haven't tried mixing and matching or building my own yet, but with the popularity of the models from Fisternis, it should be a requirement for your a character mod to work with it. Hi, good work . I use this mod together with your WoD character models for 2.4.3 and I have WoW errors when I use Tree of Life and the night elf cat form. Will you do it to work together without errors? Hi, really good job. But Travel Form doesn't change on Nightbane. It's still a cat, but with stag sounds. Looks like they use different model id for travel form. I suspect you haven't installed the compatibility patch, or haven't installed it correctly; my WoD Character Models mod comes packed with a compatibility patch and instructions. In the info.txt file, under "Installation:"
Optional: Copy COHESIVEDRUIDFORMSMERGE_patch-5.MPQ to your "Data" folder, rename to patch-#.MPQ where # is a higher number than both Cohesive Druid Forms and WoD Character Models patches. -Makes this mod compatible with my "Cohesive Druid Forms" mod by merging the changes made to CreatureModelData.dbc.